These aren't the best pictures, since they were taken with my computer, but they show the dress that I just finished. Sadie is a fan and would like one that matches. Here are a couple different pictures that show it. I was planning on wearing it with my belt... but apparently I've lost enough weight in the past week that it no longer fits. There's one New Year's Resolution I've almost got finished (and one good part of keeping busy these past two weeks). As you may have noticed from the other dresses I've sewn, I'm a big fan of polka dots. Wow you have such talent! So Sadie doesn't think mommy dress making is child abuse anymore? Now she needs a mommy princess dress. It's so much fun to wear matching dresses. 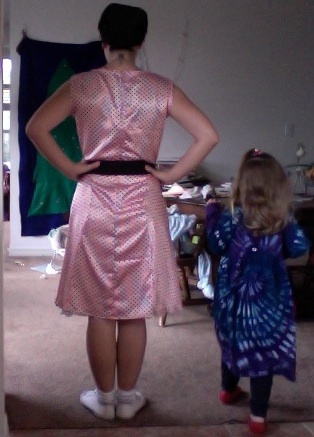 We get lots of comments when Susi and I wear our matching dresses.